Nom! 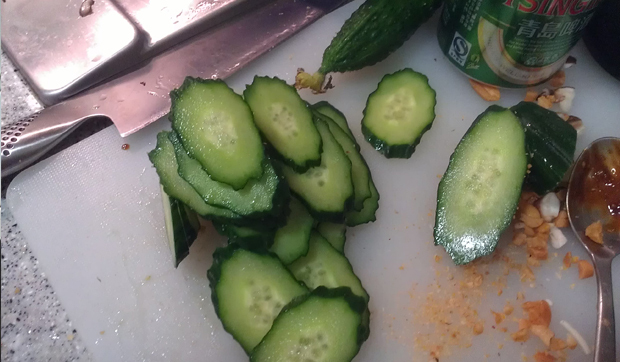 Perfect summer snack. Here’s a CRP first driven by a) hunger and b) the ever-present need for a new post. Not only am I going to translate this recipe, I’m going to try to make it as well (god save you all). 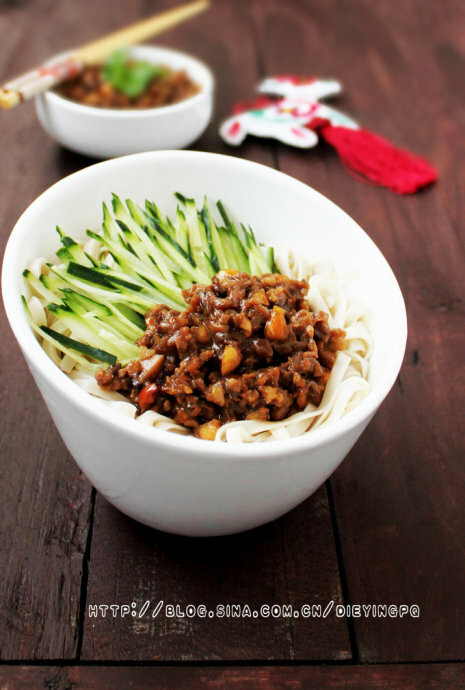 We’ll be reading the recipe for (and then making) 炸酱面 zhá jiàng miàn, which is a thick ground pork sauce over fresh noodles topped with sliced cucumber, but as I’m vegetarian, I’ll be leaving the pork out. 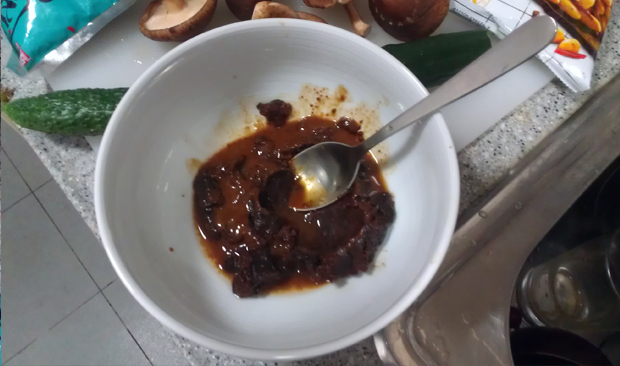 However, the recipe I’m translating does have pork in it, and this sauce really is good with pork, so feel free to put it in according to the Chinese recipe or leave it out and just use the shitake mushrooms, like I do. The 炸酱面 sauce is extremely salty, and if you do this right, you’ll think your sauce has too much salt in it until you put it on the noodles. The saltiness is heavily cut by the blandness of the noodles and the dish ends up being very savory and strongly flavored, but not overpowering. 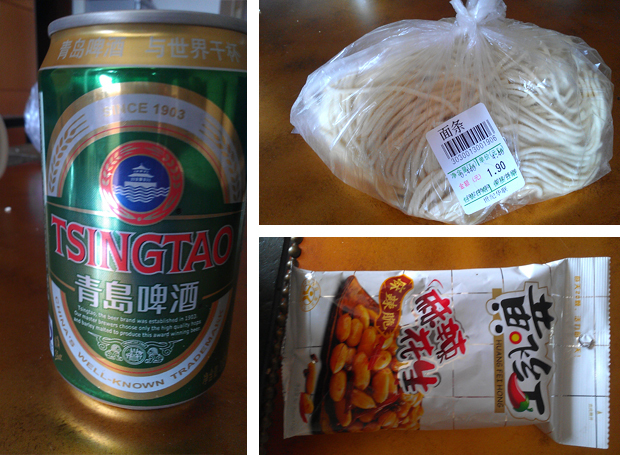 If you don’t live in China, you will need to go to an Asian grocers for one of these ingredients (the dry yellow paste 干黄酱 made from yellow soybeans) (or you can just get 黄酱 – more on that later). The original recipe in Chinese is here: http://blog.sina.com.cn/s/blog_5ddc957b0102ejb9.html?tj=1 (if you’re really feeling frisky, go read the chef’s intro on how these noodles remind her of the smells of her grandmother’s summertime cooking). Now, a little about Chinese cooking: don’t get hung up on perfect measurements – a little more of this or a little more of that isn’t going to kill anyone, and the Chinese cook very haphazardly. You’ll also notice something very interesting in this (and most recipes). We cook by eye – “cook until the edges turn brown” – the Chinese often cook by nose – “cook until the food smells fragrant”. I’m going to translate the recipe first, and below that, I’ll post some pics, some tips on the ingredients, and the cooking process. Ingredients: 150 grams of ground pork, 200 grams of shitake mushrooms, 100 grams of five-spice peanuts, one can of beer, one cucumber, and 300 grams of noodles. 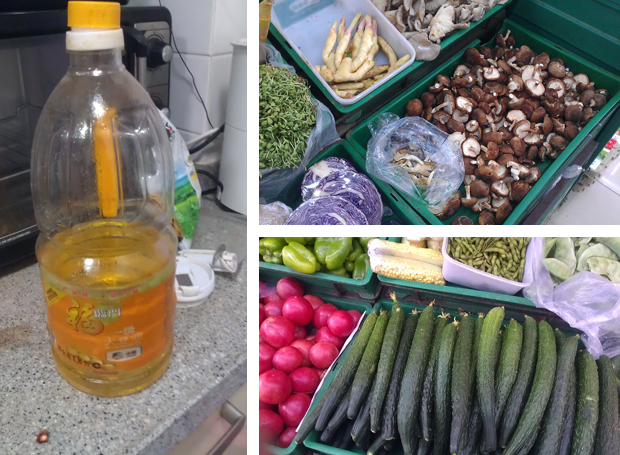 Condiments: 150 grams of dry yellow soybean paste. How to make it： 1. Slowly pour the beer [into a bowl] over the dry yellow soybean paste until it becomes a watery sauce. 2、Clean the shitakes, mince them up, and crush the peanuts into coarse granules. 7、Add in the peanuts when its time to take the sauce out of the pot [presumably: remove from heat then immediately add ground peanuts]. 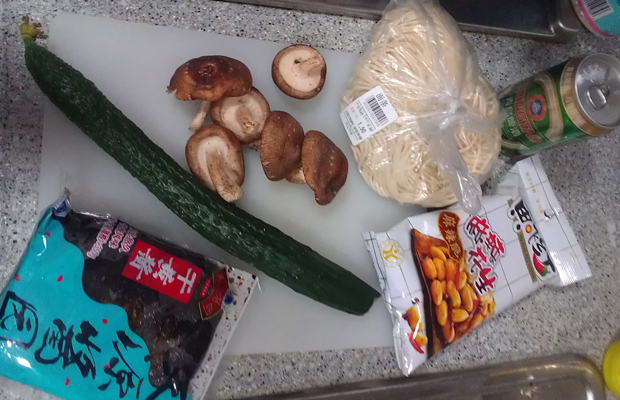 8、Put water in a pot, once it’s boiling add the noodles until it boils again, fish them out and rinse them in cool water, put the noodles in a bowl, and top with cucumber slices and the beer mushroom sauce, and it’s ready to eat. Kitchen tip: You definitely want to cook the sauce until it releases a fragrant / sweet smell. Some fresh wheat noodles. Thin, thick – doesn’t really matter. They make these noodles with all different thicknesses so get some fresh noodles that suit you. 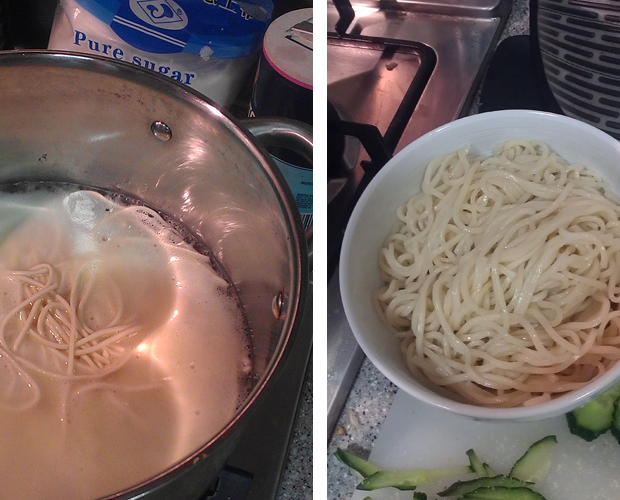 I wouldn’t recommend trying to do this with dry spaghetti or any kind of dry egg noodle – it’s really not the same. 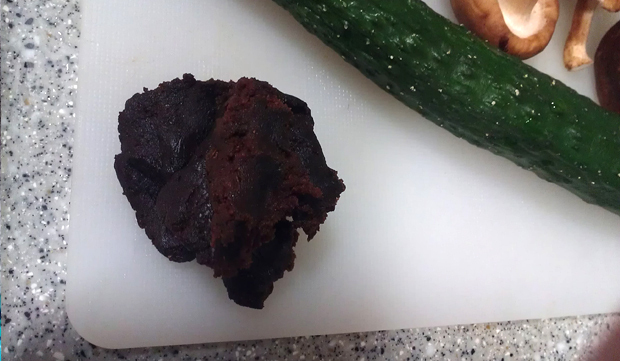 Step 1: See, 干黄酱 has a soft consistency – almost exactly like chocolate chip cookie dough. 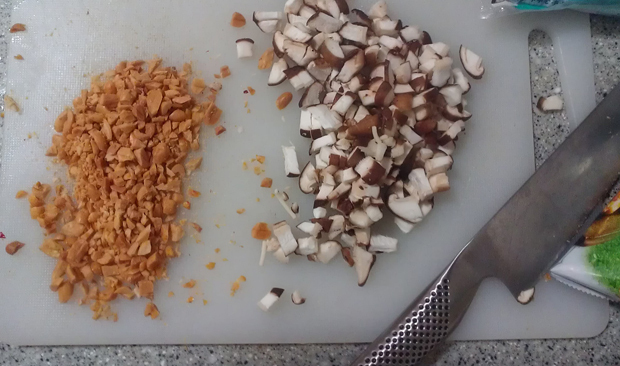 Step 2: Chop up the peanuts and dice up the mushrooms. 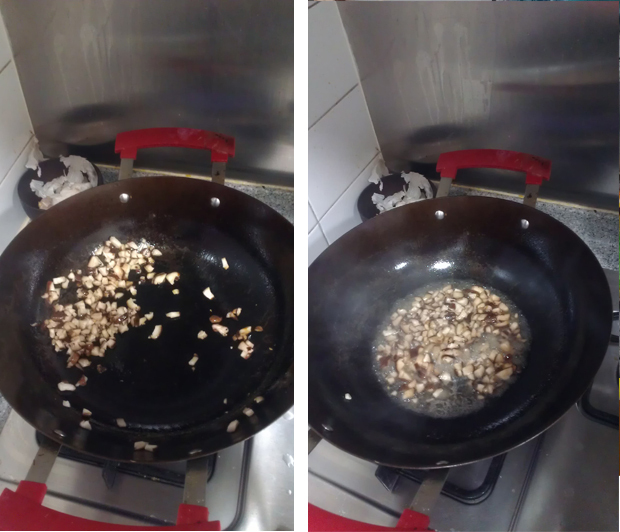 Step 3: Cover the bottom of the wok in oil (you will think you’re using too much – the Chinese cook with a ton of oil). The bottom of the wok should have a bit more than a coating of oil on it – if you swirl the wok you should should be able to see the oil swirl as well. Turn the stove on high heat, until the oil gets hot but isn’t crackling yet (about 1-2 minutes) and then toss the mushrooms in and stir-fry. I didn’t stir these long enough, I think. 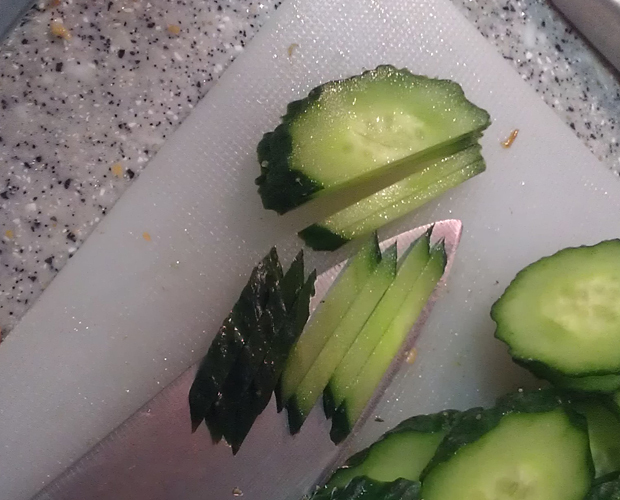 I only stir-fried them for about 1 minute. You should stir 2-5 minutes or until the edges of the mushrooms are golden brown. Step 5: Pour in the yellow bean paste sauce you made earlier and stir together. When mine looked like this, I took it off the heat. 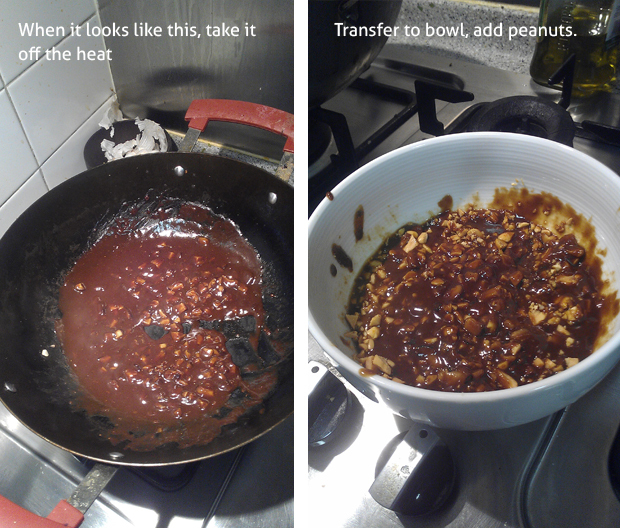 Step 6: Transfer to a bowl and add the peanuts, set aside. Step 8: When the water boils, toss the fresh noodles in the pot, wait for the water to boil again and then take the noodles out. FRESH WHEAT NOODLES COOK FAST AS HELL. You only need them in there 3-4 minutes, so test them constantly. They won’t turn a slightly different color like spaghetti noodles do when they’re done – it’s really about their consistency. As soon as they’re chewy but not in the least doughy (does that make sense? ), take them out. You really won’t need to cook them longer than 5 minutes for any reason, and very likely not that long (I’d take them out in 3 or 4 to be safe), so stand by the stove and be ready to take them out quickly. When in doubt, take them off the heat, rinse them and let sit. Step 9: When the noodles are done, take them off the heat, rinse them in cool water, and let them sit for about 3-5 minutes. 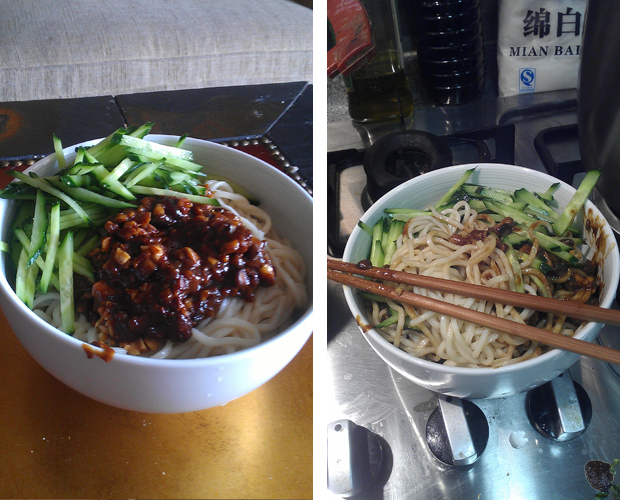 Step 10: Transfer noodles to bowl, top with cucumber strips and soybean sauce. 3 comments to "Recipe: Zha Jiang Mian Noodles Topped with Soy Bean Paste and Beer Sauce"
It’s great to see a vegetarian version of a Chinese recipe! I have been a vegetarian all my life and the last one year I spent in China was entirely by cooking my own food. Thank you so much for this! Sure! I’m very lucky in Beijing – there are dozens of amazing veggie restaurants now. Good love with this blog.